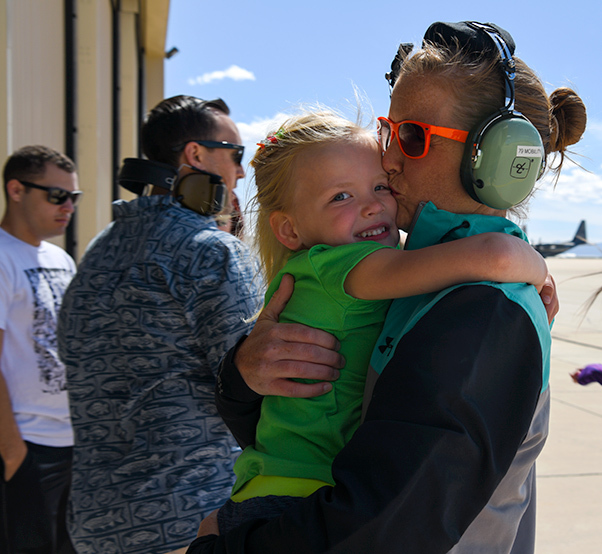 A spouse embraces her daughter after an HH-60G Pavehawk orientation flight during the 563rd Rescue Group’s annual Spouse Appreciation Day at Davis-Monthan Air Force Base, Ariz., March 17, 2018. 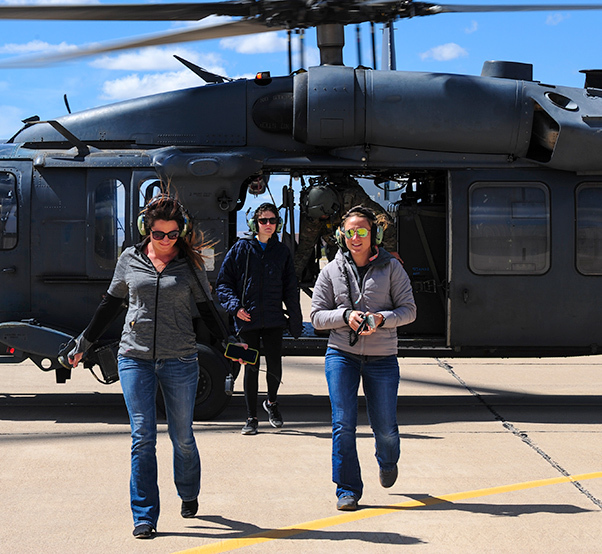 This year’s celebration provided HH-60 and HC-130J Combat King II orientation flights to 563rd RQG spouses. 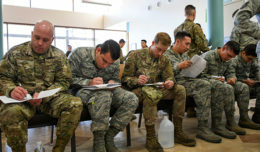 The 563rd Rescue Group from Davis-Monthan Air Force Base, Ariz., hosted their annual Spouse Appreciation Day here March 17, 2018. 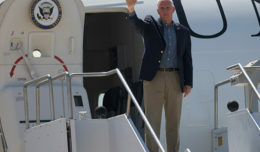 The celebration consisted of food, beverages, a bounce house for the children and HH-60G Pavehawk and HC-130J Combat King II orientation flights for the spouses. 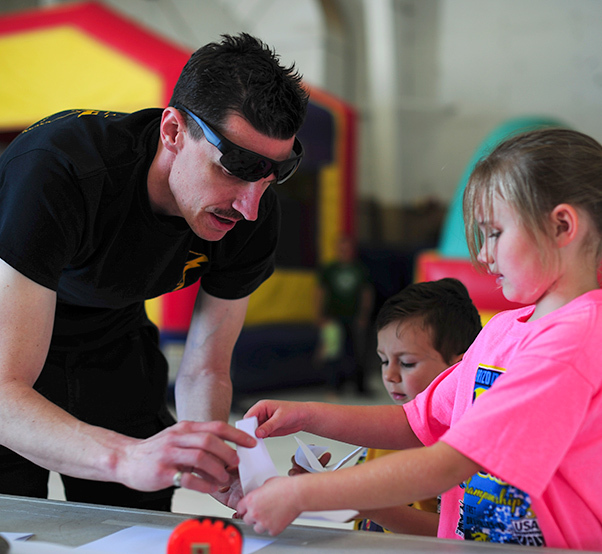 A U.S. Air Force Airman from the 563rd Rescue Group helps a child build a paper airplane during the 563rd RQG’s annual Spouse Appreciation Day at Davis-Monthan Air Force Base, Ariz., March 17, 2018. While the Airmens’ spouses were enjoying orientation flights, their children were treated to a bounce castle and inflatable slide. 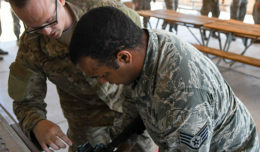 The support of the Airmen’s families is vital to the success of the installation’s mission. These families help keep the Airmen motivated, take pride in their work and continue to support the Air Force’s mission. Spouses exit an HH-60G Pavehawk during the 563rd Rescue Group’s annual Spouse Appreciation Day at Davis-Monthan Air Force Base, Ariz., March 17, 2018. This year’s celebration provided HH-60 and HC-130J Combat King II orientation flights to 563rd RQG spouses. 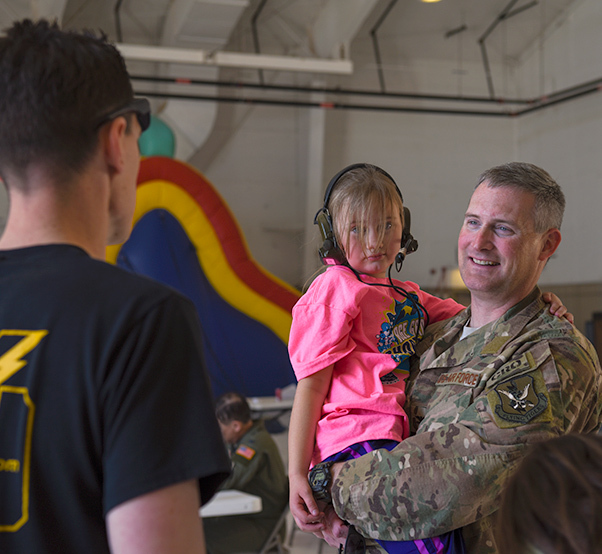 Col. Jason Pifer, 563rd Rescue Group commander, holds his daughter while talking to one of his Airmen during the 563rd Rescue Group’s annual Spouse Appreciation Day at Davis-Monthan Air Force Base, Ariz., March 17, 2018. This year’s celebration provided HH-60G Pavehawks and HC-130J Combat King II orientation flights to 563rd RQG spouses.